After posting information on my website about the Perl2Exe reversing article I published before, I got a comment with a question on how to perform the same “trick” on 64-bit Perl2Exe executables. Sadly enough at that time there was no free and easy to use 64-bit debugger available to create a similar approach for 64-bit Perl2Exe executables. However, that has changed with the release of x64_dbg. While I am still looking forward to the 64-bit version of OllyDbg, this new debugger looks very promising and with it I was able to create a fairly simple way of recovering the Perl sourcecode of 64-bit Perl2Exe executables. I decided to create this fairly short write-up about how to do this, which can also be used as a first hands-on with x64_dbg. For reference, the approach for 32-bit Perl2Exe executables (using OllyDbg) can be found here, which also describes how Perl2Exe works and what the idea is behind the approach that we also follow in this article. These details have been left out of this current article. Update 15-02-2017: User Julian commented on this article below that the instructions did not work on binaries created with Perl2Exe version 24. Updated instructions for this version can be found at the end of the article. I created a short test program to test the approach described in the article. The code of this test program is shown below. print "\n[*] Perl2exe Perl sourcecode revealer test code - 64bit\n".
" by Thijs (Thice) Bosschert\n". This file was created with Perl2Exe v16.00 and Strawberry Perl 5.16.3 for Windows on Windows 7 64-bit. 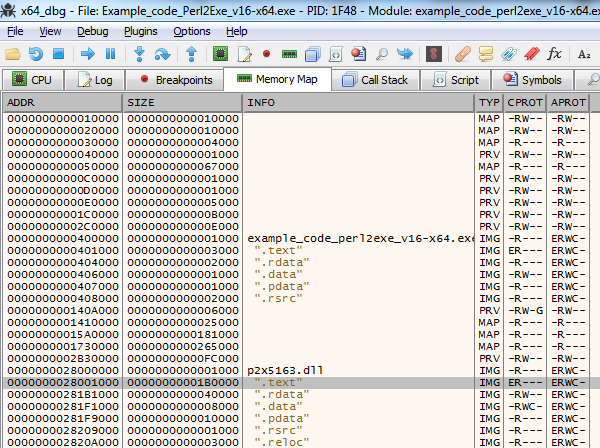 Open the Perl2Exe executable in x64_dbg with File –> Open (or press F3). Execute the program till it hits the RunPerl breakpoint (Debug –> Run or press F9). You might need to press F9 more than once before it hits our breakpoint. 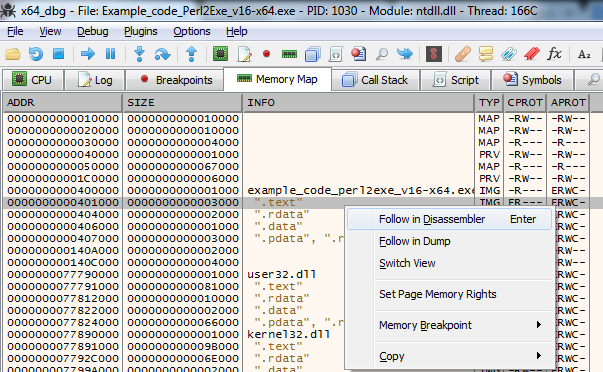 Search for “P2XDLL” string, Right Click + Follow in Disassembler (or double click it). We now end up in the follow part of the code, this is the part of the code we will be adjusting. 000000002800E77E | 48 8D 15 63 D1 1B 00 | lea rdx,qword ptr ds:[281CB8E8] | ;281CB8E8:"P2XDLL/" 000000002800E785 | 48 8B CB | mov rcx,rbx | 000000002800E788 | FF 15 D2 2E 1A 00 | call qword ptr ds:[<&strstr>] | 000000002800E78E | 48 3B C3 | cmp rax,rbx | 000000002800E791 | 0F 84 61 02 00 00 | je p2x5163.2800E9F8 | 000000002800E797 | 48 8D 15 42 D1 1B 00 | lea rdx,qword ptr ds:[281CB8E0] | ;281CB8E0:"DLL/" 000000002800E79E | 48 8B CB | mov rcx,rbx | 000000002800E7A1 | FF 15 B9 2E 1A 00 | call qword ptr ds:[<&strstr>] | 000000002800E7A7 | 48 3B C3 | cmp rax,rbx | 000000002800E7AA | 75 27 | jnz p2x5163.2800E7D3 | 000000002800E7AC | 8B 44 24 30 | mov eax,dword ptr ss:[rsp+30] | 000000002800E7B0 | 44 8B 4C 24 38 | mov r9d,dword ptr ss:[rsp+38] | 000000002800E7B5 | 44 8B 44 24 34 | mov r8d,dword ptr ss:[rsp+34] | 000000002800E7BA | 48 8B 15 87 93 1E 00 | mov rdx,qword ptr ds:[281F7B48] | 000000002800E7C1 | 48 8D 4B 04 | lea rcx,qword ptr ds:[rbx+4] | 000000002800E7C5 | 89 44 24 20 | mov dword ptr ss:[rsp+20],eax | 000000002800E7C9 | E8 E2 F7 FF FF | call p2x5163.2800DFB0 | 000000002800E7CE | E9 25 02 00 00 | jmp p2x5163.2800E9F8 | 000000002800E7D3 | 48 8D 15 FE D0 1B 00 | lea rdx,qword ptr ds:[281CB8D8] | ;281CB8D8:"BUNDLE/"
000000002800E77E | 48 8D 15 63 D1 1B 00 | lea rdx,qword ptr ds:[281CB8E8] | ;281CB8E8:"P2XDLL/"
000000002800E797 | 48 8D 15 42 D1 1B 00 | lea rdx,qword ptr ds:[281CB8E0] | ;281CB8E0:"DLL/"
000000002800E7D3 | 48 8D 15 FE D0 1B 00 | lea rdx,qword ptr ds:[281CB8D8] | ;281CB8D8:"BUNDLE/"
Select the JNZ jump instruction beneath the line containing DLL/ (line 10 in the overview above), this is the jump instruction we are going to remove so that all the files will be dumped to the local disk. Remove the jump instruction by double clicking it and typing NOP (or press Ctrl+9 to NOP it out automatically). To make sure the program does not end and remove the files again we will set a breakpoint. Set the breakpoint against removal of the files on the line before the line containing “BUNDLE” (line 18 in the overview above). 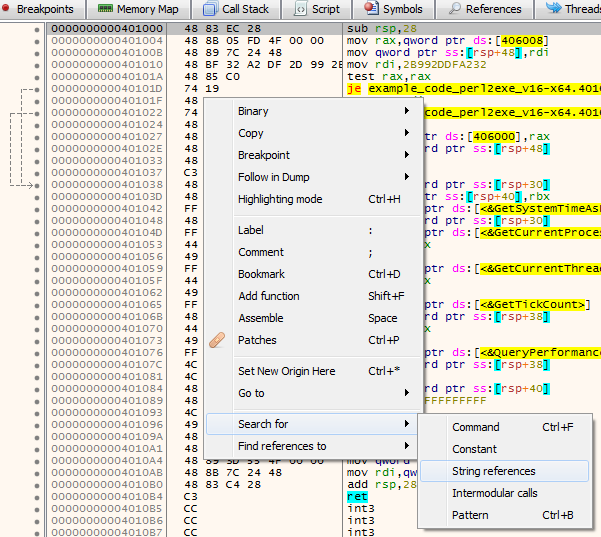 The code and screenshot below show the changed lines as well as the Breakpoint. 000000002800E77E | 48 8D 15 63 D1 1B 00 | lea rdx,qword ptr ds:[281CB8E8] | ;281CB8E8:"P2XDLL/" 000000002800E785 | 48 8B CB | mov rcx,rbx | 000000002800E788 | FF 15 D2 2E 1A 00 | call qword ptr ds:[<&strstr>] | 000000002800E78E | 48 3B C3 | cmp rax,rbx | 000000002800E791 | 0F 84 61 02 00 00 | je p2x5163.2800E9F8 | 000000002800E797 | 48 8D 15 42 D1 1B 00 | lea rdx,qword ptr ds:[281CB8E0] | ;281CB8E0:"DLL/" 000000002800E79E | 48 8B CB | mov rcx,rbx | 000000002800E7A1 | FF 15 B9 2E 1A 00 | call qword ptr ds:[<&strstr>] | 000000002800E7A7 | 48 3B C3 | cmp rax,rbx | 000000002800E7AA | 90 | nop | 000000002800E7AB | 90 | nop | 000000002800E7AC | 8B 44 24 30 | mov eax,dword ptr ss:[rsp+30] | 000000002800E7B0 | 44 8B 4C 24 38 | mov r9d,dword ptr ss:[rsp+38] | 000000002800E7B5 | 44 8B 44 24 34 | mov r8d,dword ptr ss:[rsp+34] | 000000002800E7BA | 48 8B 15 87 93 1E 00 | mov rdx,qword ptr ds:[281F7B48] | 000000002800E7C1 | 48 8D 0B | lea rcx,qword ptr ds:[rbx] | 000000002800E7C4 | 90 | nop | 000000002800E7C5 | 89 44 24 20 | mov dword ptr ss:[rsp+20],eax | 000000002800E7C9 | E8 E2 F7 FF FF | call p2x5163.2800DFB0 | 000000002800E7CE | E9 25 02 00 00 | jmp p2x5163.2800E9F8 | 000000002800E7D3 | 48 8D 15 FE D0 1B 00 | lea rdx,qword ptr ds:[281CB8D8] | ;281CB8D8:"BUNDLE/"
Binaries created with Perl2Exe version 24 seem to differ slightly from the instructions provided on this page. All other steps stay the same except in this version there seems to be no need to use the full filename fix, so that part of the tutorial can be skipped. Thank you for this great tutorial. Although I was able to re-create the file dumps for the example binary you gave, when I tried to do the same with V24 of Per2exe I didn’t get the files. It seems there’s a much smaller series of instructions and I think another call to a dll file, but as I’m not a reverse engineer I was wondering if you could give me some pointers. Hi, I dropped you an email. If you can send me the file I can take a look at it.